Kim Gorgeous Doll. Beautiful outfit. 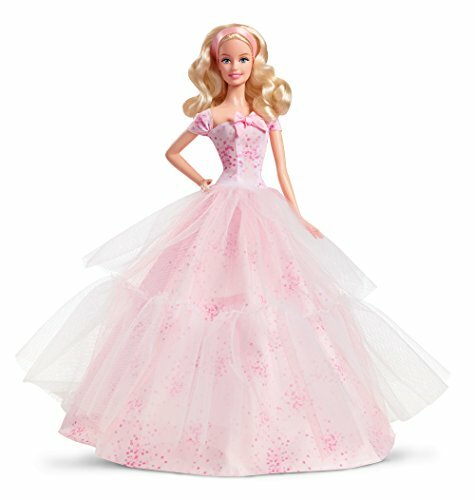 This barbie is one of the barbie's they are still making well. (As opposed to the cheap ones where the legs are not made well and don't move easily.) I gave this to my daughter because she is a brunette. The shoes come off easily when you play with it, but if you are a collector, that wouldn't matter. Great item that will stand the test of time. Corinna This doll is beautiful and looks amazing in red. Its great for kids from age 4-104.Wheather you want to play with her,or collect her,she is a great buy and is reasonably priced. Anyone who perchases her is sure to enjoy this beautiful birthday wishes doll. Susan This doll is excellent. Her face, her hair, her gown, her shoes and the gift bag. You will not be disappointed if you buy her. She is also wearing earrings and gloves. Just a perfect doll is my rating.